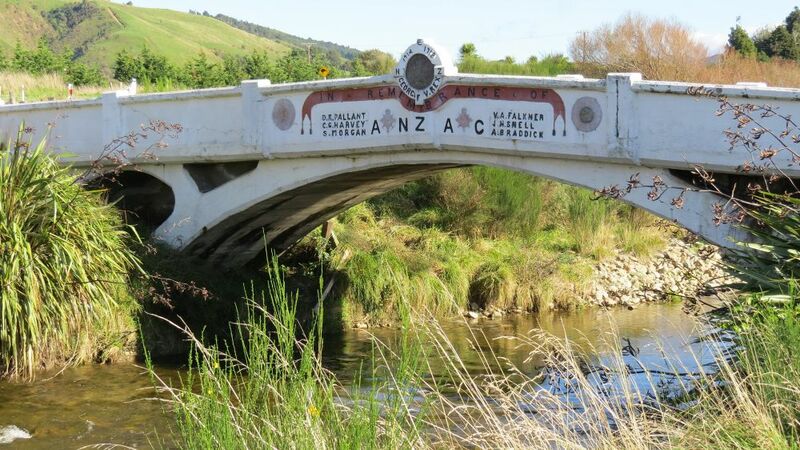 The Anzac Bridge at Kaiparoro in recent times. The bridge opened to traffic on 1 December 1922. The bridge’s north side was decorated with plaques representing local soldiers who died in World War One: Arthur Braddick, Victor Falkner, Charles Harvey, Stephen Morgan, Donald Pallant and John Snell. The plaques were dedicated on Anzac Day 1923. After World War Two, the names of William Kewley, Margaret McAnulty and Brian Minett were added. The bridge remained in use until replaced in the 1950s by a two-lane bridge a few metres downstream. The community saved the bridge from planned destruction. In recent years a local group, The Friends of Anzac Bridge, has added a path from Miller’s Reserve, maintained the structure, installed a flagpole and promoted an Anzac Day service at the bridge.